How does Word stack up in the modern era? Microsoft Word continues to set the standards for word processors, at least if you want all the trimmings – and the web and mobile apps are gradually becoming more useful as well. Almost everyone who owns a computer will know what you're talking about when you mention Microsoft Word – the veteran word processor has been going since the early 1980s, after all. But how does it stack up in the modern, cloud-focused era, with the likes of Google Docs nipping at its heels? Here we're going to take a close look at how Word works as a word processor today, on the desktop, on mobile, and on the web, as part of an ongoing Office 365 subscription. Word is also available as a one-off Office 2019 purchase, without the regular updates and without the backup of tech support from Microsoft. The ribbon interface wasn't a hugely popular move when it was first introduced, but it's helped keep Word looking fresh and relevant as computing has moved away from the desktop to mobile and the web. Its constantly shifting carousel of menus and options works very well, for the most part, with the most necessary and relevant options usually showing up when you need them (and the floating formatting toolbar that pops up whenever you select a block of text is a particularly nice touch). While it's true that some icons and labels are going to confuse users who aren't Office veterans, it's difficult to think of another way Microsoft could stuff this much functionality into an interface that remains so clean and (relatively) uncluttered. The 'Tell me what you want to do' box recently added to the ribbon is a genuinely useful aid for veterans and beginners alike. Not all of the pieces of the Word interface are a success (the theming options seem largely pointless), but as a way of bringing a host of options to users without a host of complexity, Microsoft has done a pretty good job here. As an added bonus, the interface is reasonably consistent across all the Office 365 applications. Microsoft is currently testing more refinements to the ribbon interface, with simplified iconography, better use of color and contrast, and fewer options on screen at any one time. There's no official launch date yet as to when these tweaks will roll out to every user, but it looks as though the Word interface is about to get even easier to use. Well, how long have you got? With its 35+ year heritage, just about every feature you could want in a word processor is present and correct in Microsoft Word. If anything, the argument is that there are too many features here for the average user – the sort of user who might prefer the simplicity of Google Docs instead. You can take it for granted that Word has all the tools and features you would expect from a word processor, from table and column support to advanced mail merge functions. It remains unsuitable for very complex layouts – you really need Publisher for that – but Word can be used to put together simple flyers and newsletters as well as all the usual invoices, letters, essays, and so on (the included templates continue to impress, too). One area that Word has come on leaps and bounds in recent years has been collaboration. It's now much easier than it used to be to track multiple edits from multiple users in a document, with a smooth workflow and useful colored labels so that you know who is doing what. It's easy enough to quickly hide annotations and comments too, if your screen is getting overly cluttered. Other features that have been added within the last year or so are the ability to quickly create a CV based on your LinkedIn profile – no doubt thanks to Microsoft's purchase of the professional networking platform – and improved translation tools that now cover 60 different languages. From the intuitive management of citations, sources and footnotes, to a wealth of options for formatting tables and even some basic image editing features, Word is packed with tools and tricks to help you get your documents looking their best. With collaboration and auto-save features front and center, it's adapting well to the modern app era, too. 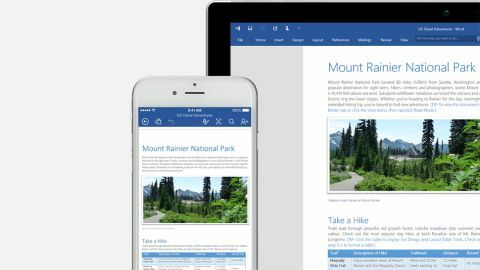 You don't need an Office 365 subscription to make use of the online version of Microsoft Office, or the apps available for iOS and Android, but you might well be making use of them alongside the desktop application. They're not as powerful as the main program, but they can definitely come in handy, especially when you're on the move. Word Online looks and feels a lot like Word for the desktop, and you've got the same ribbon interface at the top, albeit with fewer features and menus attached. Down the years this free web app has become faster and more reliable – it's still not quite as slick as Google Docs, but it's getting there. So what don't you get? There aren't as many formatting options available, and as soon as you need to do something advanced – like editing footnotes, customizing AutoCorrect options or adding new columns to a page – you're going to get directed to the desktop app. Think of it as a way of viewing and tweaking documents from any web browser, not somewhere you're going to do the bulk of your work. Likewise the Word apps for iOS and Android can view documents perfectly, and allow you to make a certain amount of changes to them, but they don't have the full set of editing and customization options. You certainly notice the difference when switching between Windows or Mac and the mobile apps. What you do get in the mobile apps (and indeed the web app) are most of the collaboration and sharing options you're going to need, so if someone has invited you to make changes on one of their documents, you don't have to wait just because you're on your phone or using a computer without the full version of Word installed. If you sign up for Office 365 Business, which includes Microsoft Word for all your users, you'll have to fork out £7.90 per user per month (plus VAT) if you're paying annually, or £9.50 per user per month (plus VAT) if you're paying monthly. US prices are $8.25 and $10 respectively. A 30-day free trial is available if you want to test it out first. As one of the oldest, and certainly the most famous word processor in the world, Microsoft Word needs no introduction. It's packed with every feature you could ever need in a word processor, and it does a reasonably impressive job of putting all that together in an intuitive interface. What Word has also managed to do in recent years is add cloud services and keep up with the slickness and simplicity of Google Docs without breaking too much along the way. Its online services and mobile apps are a little more clunky than Google's, but Microsoft is just about keeping up – and on the desktop, Word can't be beaten.